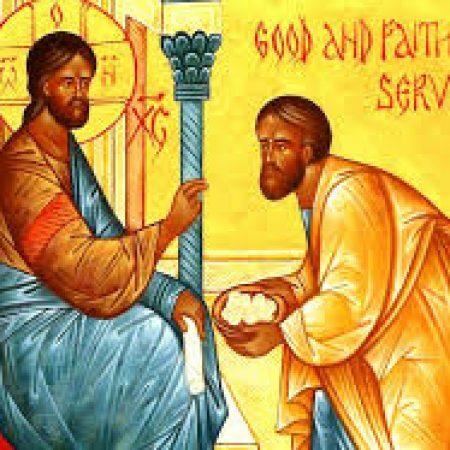 In Confirmation class this evening, we will begin looking at each person of the Trinity: God the Father, God the Son and God the Holy Spirit. We’ll start by considering different images for God. Some will be familiar: Father, King, Rock. Our reading this morning is a story in which God is judge. Now, I don’t know many people who actively seek God’s judgment upon themselves. Most of us, I would guess, would prefer to avoid the judgment, and to live solely in God’s love and grace. But even the best denial and avoidance techniques can’t get us away from the fact that the Christian faith includes belief in a judging as well as a loving God. The Bible – both the Old and the New Testament – is full of stories and examples of God judging both individuals and whole nations. That God judges is an aspect of God’s nature that the church cannot ignore. And it’s not an exaggeration to call the master “extremely generous.” Because he gave his servants great, immeasurable sums of money. In fact, a talent is actually about 15 years’ earnings; not necessarily our gifts and abilities as we might expect. And so the master entrusts this money, these talents, to each of them for “a long time.” So, not only were they given a great gift, but the responsibility of caring for it over time. What an honor these servants had been given. Now comes their part – the first two servants receive the money and find ways to double what they’ve been given. The third was afraid and hid his portion in the ground. So sometimes it’s not so bad to be judged by God. But the third servant has a different experience altogether. He starts from a place of fear, because he understands the master to be a harsh man; although, to our knowledge the master has done nothing yet that appears harsh. Perhaps he has had prior experiences with the master in which he’d been treated harshly; perhaps he had heard stories and assumed the master to be harsh. Whatever the case, he takes this great gift, digs a hole in the ground, and buries it. And then when the master returns, he confesses his fear to the master, and uses it as an explanation or excuse as to why he did nothing more than return exactly what had been given to him. So what does this say to us? Knowing that God does indeed judge us, shall we fear Him, becoming immobilized in our faith and in our lives? Shall we take the gifts He has given us and keep them hidden out of fear that we may use them improperly? Shall we stop praying, stop reading the Bible, or stop going to church because God may be judging us? Remember, the Christian faith is not complete without the judgment of God. And remember also, that it’s not always a bad thing to be judged by God. And I don’t only mean that from the perspective of being judged as good and faithful. Sometimes, to be judged and found outside the pail, or on the wrong track can be life-giving and the very thing we need. There is a ministry we support here called Teen Challenge. It is a Christian drug and alcohol recovery program in which men, not just teenagers, commit to an intense, year+-long residential treatment program, involving Bible study, worship and Christian discipleship, as well as the therapies needed to lead not only a drug-free, but fulfilling, productive lives as Christian young men as well. They’ve lead worship here – and in between their songs they give testimonies, sharing their stories and their faith. I remember one time in particular when one of the young men kept saying that he was still on the “potters wheel.” This image comes from Isaiah 64:8, “Yet, O Lord, you are our Father; we are the clay, and you are our potter; we are all the work of your hand.” He is still on the potter’s wheel. This young man was saying that God is still making him into who God wants him to be. Like that bumper sticker “God isn’t finished with me yet.” AND he can only do this by allowing God to judge him and the choices he has made in his life that lead him to becoming an addict. That, by God’s grace, he was able to hear God’s condemnation of his behavior is a miracle – and one which literally saved his life. By opening himself up to being corrected by God, he has been given a new life altogether. The reason this young man is able to do this – the reason we are able to do this – is by knowing that God’s judgment is always set in the context of God’s love. God’s judgment always occurs within and because of His love for us. God’s love is not suspended from us when He judges us. God loves us so much that He will judge us: sometimes finding us good and faithful, sometimes finding us lazy and irresponsible. We’re human, there’s no way around that. God loves us just the way we are, but He also loves us too much to leave us that way. Since we’re reading this on Pledge Sunday, it’s an easy move to hear this as an invitation to invest our resources in Godly ways – in His church. But I wonder if we might also consider the talents in this parable as the Gospel / our faith / God’s love in our life. Try thinking it through with the Gospel being the thing we’ve been entrusted with. The first two people multiply what they’ve been given – and are rewarded. The third person buries it – think about that – taking God’s love and burying it underground so that no one, not even you, can get to it. Well no wonder the consequences for that person are outer darkness and weeping and gnashing of teeth. When we choose to reject God’s love – we choose a world of darkness and despair. But when we share the Gospel, when God’s love is multiplied in the world because of us, we receive the blessings of the kingdom. It’s a risk, but one worth taking to be sure. The invitation to us today is to venture deep into God’s love so as to enter into the judgment of God, which will bring us closer to God than we could ever imagine – as individuals and as a church. I know that I am completely biased in saying this, but I can’t imagine how people live without a church. I don’t know how folks can live without that compass that keeps pointing them God-ward. I don’t know how anyone can live believing that the summation of their life is their genetics and accomplishments. I don’t know how someone can live without the church’s bread in their wilderness. I can’t imagine living without regular and explicit reminders of the immensity of God’s love, and a place to unlearn all the unhelpful and damaging approaches to making meaningful life that we are bombarded with. And so we give to support the work of this church, where we can worship the living God, grow in our faith, nourish our children, make a difference in the lives of others and an impact in the world. And God has enough money to do all this here – to be the church in this place. It’s all right here in all of us, His faithful congregation. We are a blessed people who belong to a blessed church.